Many are familiar with the Northrop Grumman B-2 Spirit’s iconic ‘flying wing’ shape. This was the first aircraft to successfully employ the flying wing design. Northrop Grumman chose the flying wing design primarily for its stealth. The flying wing is also very aerodynamically efficient, as the surface of the entire craft is used to produce lift. But like all designs, the flying wing has its downsides. Flying wings lack stability around the vertical and lateral axes. Engineers of the B-2 Spirit used a fly by wire system to ensure the pilot could control the unstable aircraft. However, the flying wing seeds of the tropical vine plant Alsomitra macrocarpa are able to glide smoothly without an active stabilizing system. Perhaps we can learn something about stability from the seed of the Alsomitra macrocarpa. Commonly known as the flying Javanese cucumber, Alsomitra macrocarpa is a species of vine found on the island of Java in Indonesia. Its seeds are stored in its gourds, which are the size of footballs. 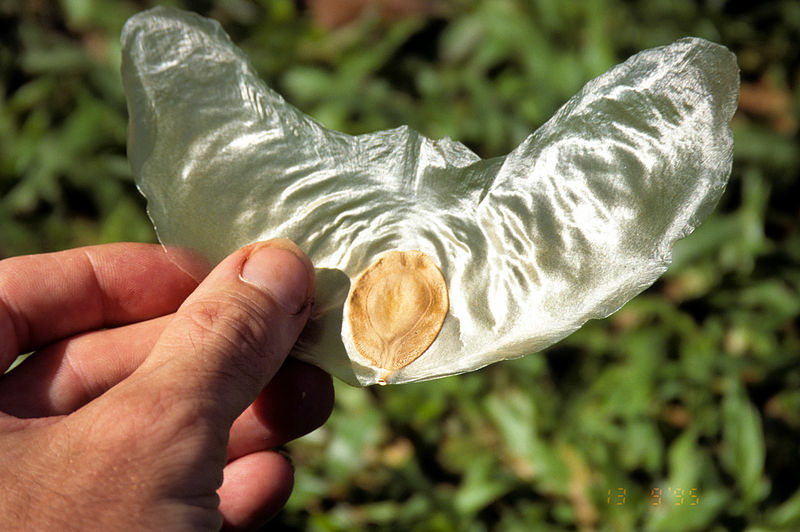 When released, the seeds’ wings allow them to glide hundreds of meters through the rainforest. A winged seed is known as a samara. Most samaras use autogyration to slow their descent. Some examples of autogyrating samaras are the seeds of certain maple and pine trees found in many boreal forests of the northeast United States. Autogyrating samaras achieve passive stability through their rotation. Alsomitra macrocarpa seeds are also inherently stable, but for different reasons than their rotating counterparts. But what does it mean for an aircraft to have passive stability? An inherently stable aircraft, while experiencing inflight equilibrium, must be able to return to its equilibrium position if it is disturbed. This requires two forms of stability: positive static stability and positive dynamic stability. Static stability refers to the general tendency of the aircraft to return from its equilibrium position. Think of a ball in three different locations: on top of a hill, on a flat surface, and in a valley. On top of a hill, the ball is at equilibrium. However, once it is disturbed, it rolls down the hill further from its equilibrium position. This is known as negative static stability. If the ball is disturbed while on a flat surface it has no tendency to move either away or back to its equilibrium position. This is neutral static stability. Lastly, if a ball in a valley is disturbed, it will roll back to the center of the valley to its equilibrium position. This ball possesses positive static stability. Dynamic stability refers to the oscillatory process by which the aircraft returns to its equilibrium position. A disturbed aircraft will attempt to return to its equilibrium position through a series of oscillations. If these oscillations increase in amplitude, the aircraft is dynamically unstable. If the amplitude of the oscillations remains constant, the aircraft has neutral dynamic stability. If the oscillations decrease in amplitude, the aircraft has positive dynamic stability. An aircraft with both positive static and dynamic stability is easy to control and inherently stable. Inherent stability is achieved by the seeds of the Alsomitra macrocarpa by wing features engineers call sweepback, dihedral, and reflexed trailing edges. Example of a wing with a reflexed trailing edge. Credit: Wikimedia Commons. Reflexed trailing edges are perhaps the most complex of the stabilizing features on flying wing aircraft. 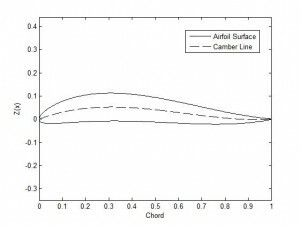 Most airfoils have a camber line that is concave down. Wings with a reflexed trailing edge have a camber line that changes concavity, making the camber line near the trailing edge have an upwards concavity. This change in camber reduces the pitch-up tendencies of flying wing aircraft. Pitch-up tendencies are very dangerous for flying wing aircraft because an increase in pitch corresponds to an increase in angle of attack. This produces more lift which pitches the wing up further, thus aggravating the process until a stall occurs. All wings are susceptible to this effect, but because flying wings have no tailplane to dampen it, other methods must be used. 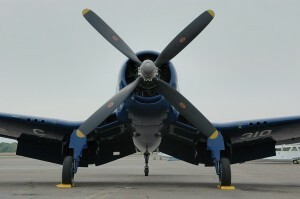 The Vought F4U Corsair has polyhedral 'gull' wings. This allows the plane to have shorter landing gear struts, making them more forgiving on hard landings. The Corsair has a very noticeable dihedral on the outboard portions of its wings. Dihedral is found on almost all low wing aircraft. Dihedral is the angling of the wings upward as viewed from a frontal perspective of the craft. This provides lateral stability, like wing sweepback. Because the wings are angled, their lift vectors are also angled. When the aircraft is banked, the lower wing will have a higher vertical component of lift than the upper wing, creating a torque about the longitudinal axis which returns the plane to equilibrium. 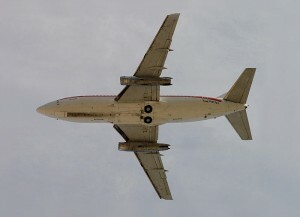 The sweepback of this Boeing 737-200 is clearly shown in the planform view. Credit: Wikimedia Commons. Sweepback is common on most modern jetliners and is used more for drag reduction than for stability. On a smaller scale however, the sweepback produces three stabilizing effects. Sweepback provides lateral stability (stability about the longitudinal axis) longitudinal stability (stability about the lateral axis), as well as directional stability (stability about the vertical axis). If a craft with swept back wings is banked, the leading edge of the lower wing makes an angle with the oncoming air that is closer to perpendicular than the upper wing, causing the lower wing to generate more lift, returning the airplane to its unbanked position. Sweepback also provides some directional stability: if the craft is yawed, the wing opposite the direction of yaw experiences an increase in frontal area which increases parasite and induced drag for that wing. Conversely, the other wing experiences a reduction in drag. These forces produce a torque about the vertical axis returning the craft to its original orientation. In flying wing aircraft, sweepback also provides longitudinal stability. In conventional aircraft, longitudinal stability is provided by the horizontal stabilizer, which generates negative lift. The horizontal stabilizer is placed at such a distance from the center of gravity of the craft (the ‘fulcrum’ of the plane) so that it produces a moment equal and opposite to the moment created by the lift of the wings. The flying wing does not have a horizontal stabilizer, but the sweep back of the wings is usually sufficient such that the wingtips are far enough behind the center of gravity to have effective leverage. The angle of incidence at the wingtips is reduced (called ‘washout’ by engineers) so that the wingtips develop just the amount lift necessary to counterbalance the moment of lift provided by the forward portion of wing. 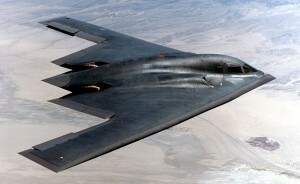 Northrop Grumman B-2 Spirit. Credit: Wikimedia Commons. These three features account for the exceptional stability and smooth gliding characteristics of Alsomitra macrocarpa. The B-2 Spirit is also a flying wing, but it does not have all of the stabilizing characteristics of the Alsomitra macrocarpa. That is because there is a tradeoff between stability and maneuverability. Maneuverability and stealth were some of the goals of the B-2 Spirit designers. They achieved stealth by using the flying wing planform. They achieved maneuverability at the cost of decreased longitudinal stability. To compensate for this, the engineers designed a fly by wire system to give the aircraft artificial stability, in which the computer corrects inflight deviations much faster than a human, preventing divergent oscillations that would be very difficult for pilots to recover from. Although the seeds of Alsomitra macrocorpa and the Northrop Grumman B-2 Spirit may both be flying wings, they rely on different methods for stability. Alsomitra macrocorpa uses passive stabilization built into the wing geometry, where as the B-2 Spirit uses computers to correct for minute disturbances. Flight Stability lecture notes (PDF), Projeto AeroDesign, Brazil. I find it fascinating how engineers are able to manipulate aerodynamic designs found in nature in order to increase maneuverability and stealth. Even with the loss of stability, though, they are still able to control the aircraft with the development of the fly by wire system. Very interesting article. It also brings up questions about the validity of pilots if they need computers to help them safely and effectively fly the aircraft. The fact that a plant seed is given the capabilities of gliding with passive stabilization is amazing. Even more so is the applications to modern aircraffts of this passive stabilization. Passive stabilization certainly can add some relief to pilots.